Blotchy or blemish-prone skin often suffers from clogged pores, bacteria build up and inflammation. 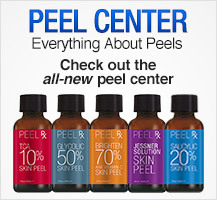 Salicylic acid peels target each of these issues to help dramatically improve the skin’s overall look and health. Clogged pores don’t stand a chance against beta hydroxy acid, which exfoliates excess dead skin in and around the pore lining. The antimicrobial properties of salicylic acid render it highly effective against the bacteria and inflammation that often leads to breakouts. Due to its close relation to the popular anti-inflammatory known as acetylsalicylic acid (aspirin), salicylic acid also functions as an anti-redness agent. Thus, this potent free radical fighting acid is extremely effective at resurfacing the skin and helping to prevent blemish flare ups.